Posted on Jan 12th, 2015. 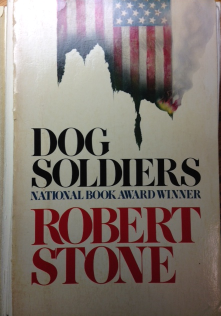 I can’t explain the effect Robert Stone had on me, except to say that his writing changed my life. I was 30 when the author Jack Cady told me to read Dog Soldiers. The book turned out to be stronger than the heroin at the center of its plot. The writing enchanted and stunned me. It rearranged my dreams. If not for Cady’s encouragement and Stone’s example, I wouldn’t have spent 25 years writing Wire to Wire. I certainly wouldn’t have spent the past five years on my current novel, which owes a great deal to Dog Soldiers. I was lucky to have two personal conferences with Stone, one disastrous, one comical. The bad one came on the last day of the Port Angeles Writers Conference. Five minutes into our one-on-one, Tobias Wolf showed up offering Bob a ride to the airport. He looked at me, said, “Keep it up,” and left. We met again four years later at the Squaw Valley conference. The problem this time was that someone had taken our conference room. We decide to sit outside on the patio, but a fierce wind was whipping down the mountain. Stone turned the first page of my manuscript and the wind just ripped it away. I imagine it’s still out there somewhere. After about five minutes, we gave up. I didn’t really mind. He had already given me more than I could ask. In my essay, No Other Way Out for Bloom, I wrote about a passage from Hall of Mirrors that kept me from quitting during the 25 years it took to write Wire to Wire. The energy and the manhood to wrangle it versus the deadly and poisonous bile: The stakes were pretty damn clear. Over and over I returned to that passage. On the days and nights when I hated my manuscript and hated my inability to finish, those words kept me going. I couldn’t quit. I didn’t want to be Rheinhardt. In a recent interview with Tin House, Stone said he wouldn't quit writing until he died.